Tars Bokara has the unenviable task of seeking out the unlikely location of the long-lost planet Earth. When he finds it, he discovers a thriving business covering the entire world, with employees eager to please. Want to take a guess what their hours are? Also, Rish talks (and talks and talks) about his recent trip to Comic-Con. Romance, frustration, and murder attempts abounded, apparently. Somewhere in all this, Big tells him why the show’s never had a Parsec nomination. Special thanks to Julie Hoverson and Christy Maia for lending their voices to today’s episode. Edward McKeown’s SFWA site and his SFReader site. Julie Hoverson’s 19 Nocturne Boulevard. Music was Fly by C.J. Rogers. 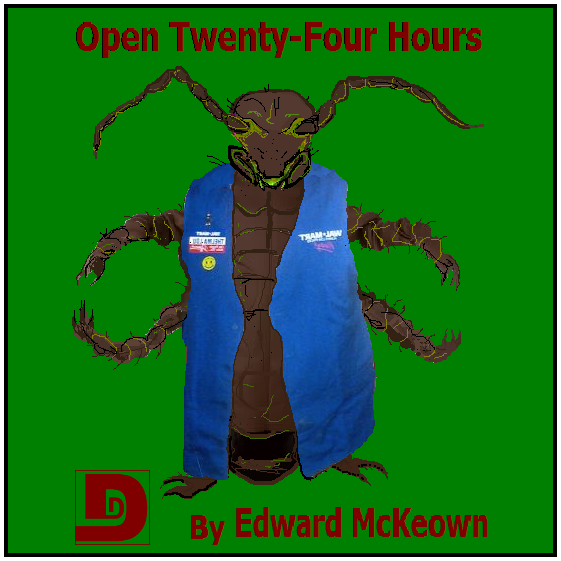 This entry was posted on September 4, 2010 at 8:07 am and is filed under Comedy, Edward McKeown, Science Fiction, Short Story. You can follow any responses to this entry through the RSS 2.0 feed. You can skip to the end and leave a response. Pinging is currently not allowed. Ahhh….This week’s Dunesteef looks gloriously long! Starting a new job this week but want to listen to the episode quickly so we’ll see if the superego or the id wins out this time. There was an RPG set in almost this world. It was called “Low Life,” if I recall correctly. Characters could be rats, roaches, degenerate once-humans, or hideously un-alive snack cake beings. It was… odd. Yeah, the roach voice was AWESOME. It made the story. What a fun story. Loved the cockroach voice. yeah, that was definitely a fun story and reading. now for the conversation afterwards. STORY: Like others before, I too had to keep reminding myself that this is intended as a comedy, and as a sci-fi comedy you have to allow certain scientific inaccuracies to slide by. I mean, I’m a fan of Red Dwarf, I think I can handle this. I would’ve liked a little more negotiation with Bob, or some sort of challenge, although the “I’ve told off the humans” bit was very funny. And the management digs were awesome. Overall enjoyable. PRODUCTION: The only voice I didn’t care for was Bob the Cat. Also, Tars’s boss’s voice seemed to occasionally dip into southern/western before rising out again. COMMENTARY: Rish, you said the audience did a 360 when purple dude proposed to purple girl. Very Yogi Berra of you; I don’t know if you intended it that way or not. Personally, con reports don’t do it for me. I like con STORIES — like, funny stuff that happened — but REPORTS (ie: I saw this trailer and these actors etc) aren’t my bag. Congrats on the Parsec nomination. I live in Atlanta; if you guys need someone to stand at the podium and read your acceptance speech next year, let me know. I’m actually planning to ATTEND D*C next year, for the first time in what will be seven years of residence here. FWIW, I thought the cockroach voice was the cockroachiest voice I’ve ever heard. If you ever saw a picture of my family tree, all would become clear. And regarding Josh’s . . . er, “compliment,” I’ve got to admit, I meant 180. Math sure ain’t my strong suit. Great job! I also enjoyed the cockroach voice and Bob being both management and a cat was perfect. Cockroach voice was excellent, enjoyed the story. Rish, really liked your con stories, I don’t care what anyone else says. Big, what’s with your microphone? Had a bit of a ring to it, almost as irritating as a 3-D movie. Thank God I didn’t pay an extra dollar to listen to it. Great story. The humor was right up my alley. I also enjoyed all the voice work, including Mr. Cockroach, although I can see how it might irritate some. Thanks for the con stories. Living on the East Coast I have yet to make it out to Comic Con, so its nice to get an idea of how things roll there. (my local con, while still good, is much, much smaller than CC or Dragoncon). I hadn’t heard about the stabbing. The pen is mighter, etc, etc. (I can never type that line without hearing it in a Sean Connery voice now, IE ‘Celebrity Jeopardy.’ Thanks SNL).